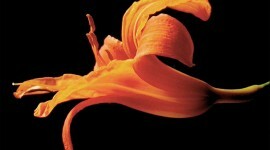 One of the last day lilies of 2009 unfolds in this three-hour timelapse (click the play button to view the timelapse). 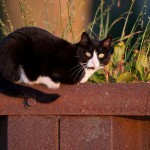 A cat unaccountably sits on the open breakwall of Algonquin Island. 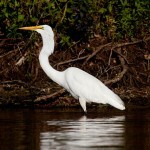 Great egrets do the most fantastic then when they catch and swallow a fish — all of their feathers stand on end. In this progression, an egret catches a fish (left), swallows (centre), and totally punks out (right). 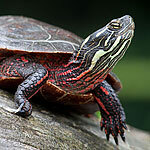 Taking a page from the old “Is it live, or is it Memorex?” ads, a large painted turtle leans into the sunset light of a gorgeous August evening. 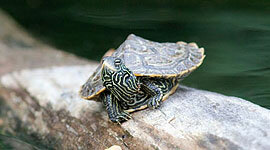 A tiny painted turtle fills the camera’s entire frame, hovering just inside the minimum focus distance of the lens. Sadly Trumpeter swans never stay long in our sunny climes, but when they do visit it’s always a small event. 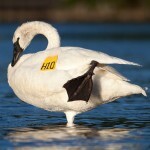 Here Trumpeter H10 does its best to turn itself into a pretzel, balancing in the shallows off of the QCYC’s Rapids Queen. 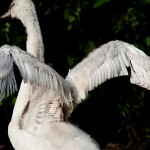 An adolescent mute swan spreads its wings, still growing and as yet unable to fly. 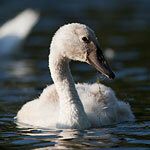 A mute swan juvenile learns to feed off of Centre Island. Snow-white mute swan cygnets learn to feed off of Snake Island. 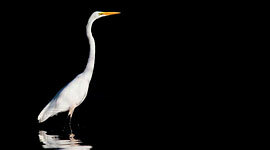 A snow-white great egret stands in full sunlight, against a perfectly black background of deep shade. 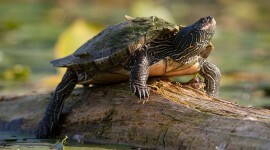 This panorama is available as a special 8×18″ panoramic print, see Boutique Pricing for details. 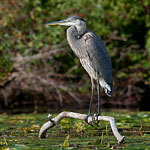 A great blue heron perches on a branch in the Trout Pond.